PMC Wafer 2 review | What Hi-Fi? Now here's a perfect example of the appeal of a high-end on-wall speaker. The PMC Wafer 2s can, like their rivals, be hung from your wall and hidden from view – but despite that, they have much the same drive units as the company's much larger, much more conventional and strictly floorstanding FB1is. They even employ a clever 'H-shaped' version of PMC's oft-used transmission line technology, designed to squeeze both the maximum output and the best possible quality from your bass. 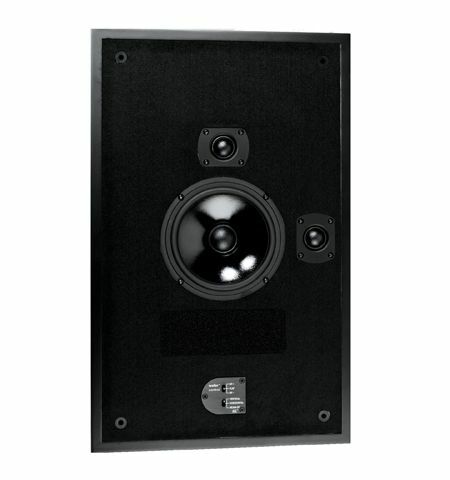 Unlike its rivals such as the Monitor Audio SoundFrame 1 and Image Audio IA8, the Wafer 2 can be orientated either vertically or horizontally, thanks to its use of twin 27mm soft-dome tweeters equipped with an orientation switch on the front of the cabinet. Select the appropriate option and whichever way the speaker is orientated, the operating tweeter will always be situated above the bass unit. There's also a 'Beam Up' feature designed to tilt the image slightly, to ensure effective imaging even when the speakers are positioned below or above your listening position. Finally, a second fascia dipswitch allows for either a subtle boost or a mild roll-off in high-frequencies depending on your needs – for example, where the speakers are installed behind a perforated screen in a home cinema installation, it may be desirable to boost their treble a little. Most on-wall speakers have fairly wide front baffles that can, in theory, colour the sound. But the special absorbing material on the Wafer 2s is designed to control reflected sound from the drivers, ensuring that you don't hear undesirable effects. To our ears, it works well, and with their grilles in situ, there's no apparent price to pay in terms of aesthetics. The sound is exceptional, in fact. It's so good that one of our team commented that, after a period listening to Sufjan Stevens' Jacksonville, that he had forgotten that he was listening to anything other than very good – perfectly conventional – loudspeakers. The Wafer 2s appear to have it all: precision, speed, soundstaging power, room-filling scale and substantial, accurately defined bass. They'll rock with enthusiasm, grip complex rhythms and invest emotive vocals with just the right amount of energy – and they'll do all that even when obscured from view by a screen-print of your favourite photo. That's where the price rockets – but it's to the speakers' credit that despite that, they're good enough to earn five stars.